Castlewood Avenue, just near the Swan shopping centre in Rathmines is an odd home for restaurants. The much loved (but varied) Mash didn't survive there, and you'd wonder what chance a new restaurant has in this location, especially given the general downwards trend in eating out. To survive these days, you need good food, served with a smile, offered at good prices, and preferably with some kind of unique selling point. Well, Tippenyaki offers all the above. 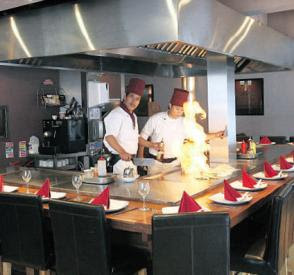 The focal point of the dining room is the large teppan grill (a huge hot plate) on which two chefs cook food to order. A counter runs around the teppan with seats available and the chefs perform for the diners as they cook. This performing tends to involve lots of flipping and spearing food on forks in midair. Other tables are spread around the restaurant for those who don't want the heat of the grill. This was my second time eating in Tippenyaki - and while I didn't think it was as good as the first time, I still think that it's good. Sushi is available in addition to the teppan-grilled food, and is prepared to order. It was of excellent quality and a sushi platter featured a nice mix of raw and cooked sushi, beautifully presented. If you order a plate of teppan-grilled food, then you also receive a small green salad or a bowl of miso soup as a starter. The miso soup was excellent with just the right hint of smokiness and featured nice lumps of tofu and crabstick at the bottom of the bowl. The grilled meats are served with grilled vegetables, a bowl of fried rice and sliced of fried potatoes (this is the genius touch, I think). There's plenty to eat on a single plate and it tastes great. I hope that Tippenyaki won't fall foul of vagary consumers (as a resident of Cork for many years I watched good restaurants open and fail because customers just didn't get it) and the worsening economy. A reviewer for the Irish Independent said that this place had opened 5 years too late. Well, the boom times may be over for bad restaurants, but good restaurants never open too late.